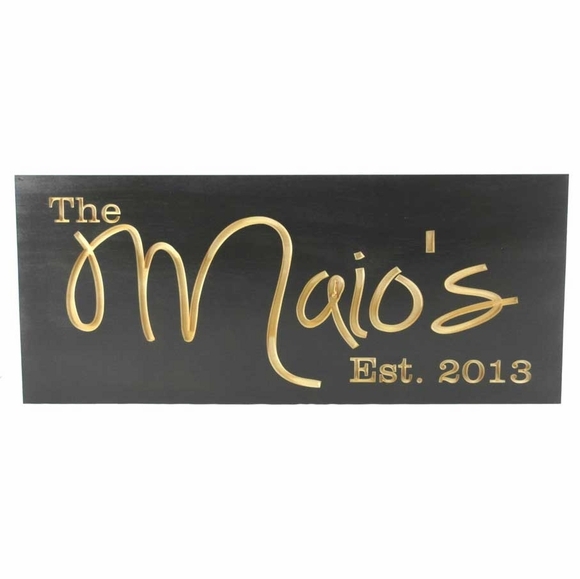 Carved Wood Family Established Sign - - custom made wooden carved family name plaque for indoor display or protected outdoor use. Made in USA. Personalized with the family name in a boldly modern cursive font, the year the family was established (est. ), and the edge style you select. Solid pine construction with carved personalization. The Family name line holds up to nine (9) large letters. Please enter the four-digit Est. year in this format: XXXX. The word "The" is standard in the upper left-hand corner. This type of sign is always a popular gift for a special anniversary with the wedding year and as a housewarming gift with the year the house was purchased as the established year. And it's a thoughtful and affordable gift for Real Estate agents to give their new home buyers. Black finish with natural text that takes on a golden hue as a result of the carving process.